The Toy Fox Terrier is a small dog with a short thick coat, erect v-shaped ears and large brown eyes. Toy Fox Terriers are highly trainable and intelligent. A Toy Fox Terrier should be about 10 inches (25 cm.) in height. The Toy Fox Terrier has a predominantly white coat with different colored markings including tan and black. The Toy Fox Terrier 's smooth short satiny coat is easy to take care of and requires only occasional brushing. The Toy Fox Terrier is a light shedder. Toy Fox Terriers are extremely loyal, curious and intelligent. Ameritoys believe that they are big dogs. They are highly trainable and make good companions for the deaf or the disabled. Toy Fox Terriers are energetic but not yappy. Toy Fox Terriers are prone to leg calve perthes and stifle, some are allergic to beet pulp, corn and wheat. The expected life span of the Toy Fox Terrier is about 13-14 years. Toy Fox Terriers are active indoors and will generally take care of their own exercise needs. They are intolerant of cold weather. The Toy Fox Terrier is in the Toy Group. What does the Toy Fox Terrier look like? The athletic Toy Fox Terrier is small, muscular, elegant, and graceful. The short, fine, glossy coat is white and black with a tan face (tri-color), or white and chocolate with a tan face (chocolate), or all white with a tan face (tan and white). The chocolate variety is not permissible under UKC show standards. Toy fox terriers stand about 8.5 – 11.5 inches tall and weigh from 3.5 – 7 pounds. 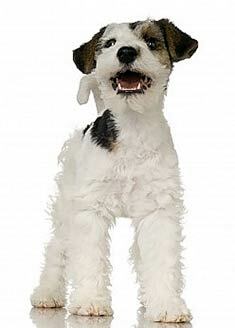 The Fox Terrier is very recognizable due to its upright, triangular-shaped ears and large eyes. The body is basically square-shaped, and the tail may be left long or cropped to about two-fifths of its natural length. The Toy Fox Terrier is, as its name implies, simply a smaller version of the Fox Terrier, specifically the smooth-coated variety rather than the wire-haired. The Fox Terrier was accepted as a unique breed by the United Kennel Club in 1912, although the breed standard goes back as far as 1876. Between 1912 and 1920, breeders found that the runts of the litter were often the scrappiest, and began developing the smaller dogs by preference. To produce the smaller size dogs, Smooth Fox Terriers were crossed with Min Pins, Italian Greyhounds, and Chihuahuas. In 1936, the UKC recognized the smaller dog as a new breed and began taking registrations separately from the Fox Terrier. The Toy Fox Terrier is very intelligent. They were often used as circus dogs due to their easy trainability and clown sensibilities. They are very active, as are all terriers, but make wonderful companion animals for both the elderly and the disabled. Careful training will reduce the amount of barking the dog does. They don’t need regular exercise, as they will take care of their own activity needs, even in an apartment setting. His terrier ancestry makes the Toy Fox Terrier sturdy, energetic, impulsive, and spunky, while his toy breed ancestry brings a love of cuddling and easy trainability. You will find that the dog loves to play ball and is a bunch of fun to watch! The Toy Fox Terrier is very independent-minded, some would say stubborn. They want to be the boss, but will accept you as dominant if you establish yourself as the alpha dog at the beginning of your relationship. Careful socialization is required to overcome the dog’s suspiciousness towards strangers. This is important because suspicious dogs are often biters, leaving you open to a world of liability. The Toy Fox Terrier typically lives about 15 years, and is generally healthy. Some of these dogs are prone to allergies to beet pulp, corn, and wheat. As with many of the smaller breeds, the Toy Fox Terrier is prone to patellar luxation. This condition causes the kneecap to dislocate either to the inside or the outside of the knee. In milder forms, the dog may be only slightly uncomfortable and little treatment is required. More severe dislocation can be crippling and requires surgery to correct. The Orthopedic Foundation for Animals offers a registry for breeding stock, certifying them as free from this disease. Although puppies from healthy parents can still experience patellar luxation due to injury, there is a genetic component, and prospective breeders should be interviewed carefully about the OFA status of their breeding stock. Also common in the Toy Fox Terrier and other short-haired breeds is a skin disease known as demodectic mange. Parasitic demodectic mites are found in small numbers in the hair follicles of most dogs. However, when large numbers of the mites are present, they can cause hair loss, primarily on the head or front legs. Demodicoses may occur 2 – 3 days after birth if contracted from the puppy’s mother, or in dogs 3 – 13 months old if the dog has the juvenile onset form. Adult onset demodicoses starts in dogs over 5 years old and may be associated with cancer or other internal diseases. Many small breeds suffer from Legg-Calve-Perthes Disease, in which the hip joint loses its blood supply, causing the loss of bone at the top of the femur. Similar to hip dysplasia in larger dogs, Legg-Calve-Perthes Disease causes lameness. Cortisone shots may be helpful in controlling the pain, and some dogs have had success with an operation to remove the head of the femur, leaving only a muscle joint in its place. Because this dog’s hair only grows to about ½-inch long, very little grooming is required. However, the dog does shed a fair amount, so the time you save on grooming, you will likely spend vacuuming. Are Toy Fox Terriers good with children and other dogs? Unfortunately, they are not. As with many toy breeds, the Toy Fox Terrier is simply too fragile to play with small children. It is easy to assume this scrappy dog can take anything, but children are often too rough even when they don’t mean to be. Because the Toy Fox Terrier is so small, children may step on them, sit on them, or squeeze them too hard, causing irreparable damage. Toy Fox Terriers are quick to react to any rough handling, which could permanently disfigure your child. Even adults must be careful with any toy breed. They like to sleep under the blankets or pillows, where you can easily roll over on them. If they decide to jump out of your arms onto a hard surface, it is probable they will be killed. You must be ever-vigilant with a dog this small, always keeping your attention focused on where the dog is and who he is interacting with. Keep in mind that these dogs are smaller than the average newborn, but they move a lot more quickly and can get underfoot like any other dog. Finally, small dogs do not always mix with larger dogs. If you have a big dog that loves to play, you will be putting your Toy Fox Terrier at risk by allowing them to play together. The larger dog can snap the small dog’s neck simply by roughly shaking him as he does a toy. These dogs are not for everyone due to their high activity level and natural suspiciousness, but under the right circumstances they can be wonderful companions who will entertain you for many years. Find Toy Fox Terrier Puppies with our Free Breeder search!